Acupuncture today not only provides hope for the patients, in whose case all hopes were lost until now but has opened the gates for the researchers who are finding explanation and putting theories of its mechanism. Acupuncture is an excellent therapeutic modality in case like Arthritis, Migraine, headache, Cervical Spondylitis, Trigeminal Neuralgia, Polio, Addiction, Psoariasis, Epilepsy, Bronchial Asthma, Rhinites, Various Gynachological disorders, Psychiatric disorders, Anaesthesia etc. It will be our privilege to introduce you to the Science of Acupuncture. We would teach various theories, Mechanism and Clinical applications. This training is being given to medical practitioners of any system of medicine. This institute is affiliated to Medicina Alternativa of Open International University of Complementary Medicine, Colombo. 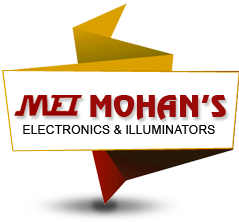 We have planned the course in such a way that enough time is given to grasp the full subject. After the successful completion of the course Diploma in Acupuncture Therapy (D Ac. T) will be awarded. Total fees for the courses is Rs. 4000/- . Please find enclosed herewith the applications from for enrollment. 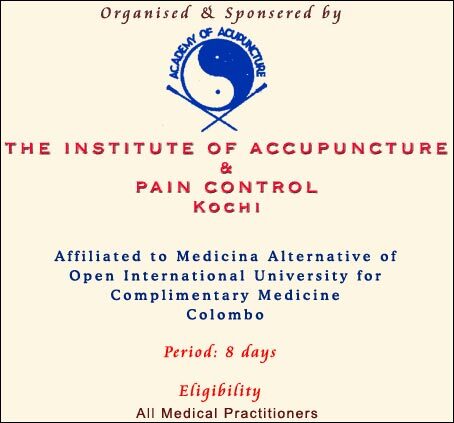 Kindly send the duly filled application from with an MO/DD/Cheque for Rs: 1000/- favouring , "The Institute of Acupuncture & Pain Control, Ernakulam" so as to reach this office atleast 3 days in advance. The balance fee can be paid when the course commences.